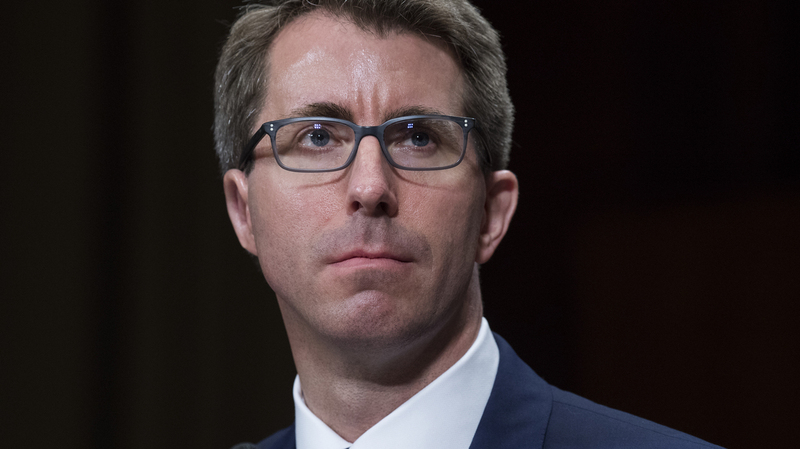 Appeals Court Nomination Withdrawn Before An Expected Failure On Senate Floor The White House withdrew the nomination of Ryan Bounds to join the 9th Circuit just before a vote was expected on Capitol Hill on Thursday. The White House withdrew the nomination of Ryan Bounds to be a judge on the 9th Circuit Court of Appeals. Senate Majority Leader Mitch McConnell, R-Ky., announced the withdrawal ahead of a confirmation vote when it became clear that passage was uncertain. This is a rare loss for McConnell on a nominee after his string of confirmations since the start of the Trump administration. The issue for senators appears to have been Bounds' previous writings, which have been criticized for racist tones. South Carolina Sen. Tim Scott, the only African-American Republican in the Senate, did not support the nomination, dooming Bounds in a Senate divided along party lines 50-49, with Sen. John McCain, R-Ariz., absent from Capitol Hill due to his battle against brain cancer. "After talking with the nominee last night and meeting with him today, I had unanswered questions that led to me being unable to support him," Scott said in a statement provided to NPR. Scott's objections led to other senators reconsidering their position on Bounds' nomination. "Sen. Scott brought his concerns to the group as a whole at lunch. After Sen. Scott explained his concerns, multiple other senators expressed reservations," a GOP aide familiar with the discussions told NPR, indicating that roughly 15-20 senators also indicated they had issues with the nominee. Another Republican source familiar with the meeting told NPR that Scott raised concerns to Sen. Marco Rubio, R-Fla., about Bounds' college writings, and "Marco said he'd be a no with Tim, which broke the dam." Then, once more Republicans also indicated they would vote no, Bounds was withdrawn, the GOP source said. Bounds is an assistant U.S. attorney in Oregon who was nominated in September 2017 to become a federal appellate judge. A review by the progressive Alliance for Justice found that in his past writings from his undergraduate days at Stanford University he had written critically about "strident racial factions in the student body" and their work to "build tolerance" and "promote diversity." He said these efforts "seem always to contribute more to restricting consciousness, aggravating intolerance, and pigeonholing cultural identities than many a Nazi bookburning." He complained that multicultural organizations at the elite university "divide up by race for their feel-good ethnic hoedowns" and argued that "race-focused groups" should not be welcome on campus because the "existence of ethnic organizations is no inevitable prerequisite to maintaining a diverse community—white students, after all, seem to be doing all right without an Aryan Student Union." During his confirmation hearing in May of this year, he apologized for those past writings. "Being nominated for judicial office is an honor, but it has its downsides-including having the ill-considered, tone-deaf, and mortifyingly insensitive pronouncements of one's youth unearthed and scrutinized....the objectionable words and views recited from three or four of my college opeds do not reflect the views I have hewn to as a lawyer and, frankly, as a grown-up. Achieving a more egalitarian and inclusive society has always been centrally important to me. Appropriate sensitivity to the views of others-particularly those from marginalized communities-about how best to pursue that aim, however, came to me only after I'd left college for the workaday world. I regret that, and I apologize to you all for the obnoxious tone and misguided sentiments you will hear about because of it." Bounds wrote. Neither of Oregon's two Democratic senators supported Bounds when his nomination came before the Senate Judiciary Committee, citing those writings while at Stanford, NPR's Carrie Johnson reported in May. Critics of Bounds were concerned about views on sexual assault, workers' rights, people of color and LGBTQ people, Johnson also reported. Senate Democrats are raising the issue of Bounds' writings as a reason to insist on access to all of the written record for Judge Brett Kavanaugh, President Trump's nominee for the Supreme Court. "Republicans just sunk the Bounds nomination based on his college writings. After that, how are they going to argue that Judge Kavanaugh's White House papers aren't relevant to his nomination to the Supreme Court? A lower court nominee's college writings are relevant but a Supreme Court nominee's White House writings aren't? I don't think so, " Matt House, spokesman for Senate Minority Leader Chuck Schumer, D-N.Y., wrote to reporters Thursday afternoon. Democrats' want access to all of Kavanaugh's memos and other writing from when he served in the George W. Bush administration, and when he worked for independent counsel Kenneth Starr during the investigation that led to the impeachment of President Bill Clinton. Earlier Thursday, the George W. Bush Presidential Library And Museum released online a preliminary cache of what is expected to be many records from Kavanaugh's time in that administration. NPR Congress Editor Deirdre Walsh contributed to this report.